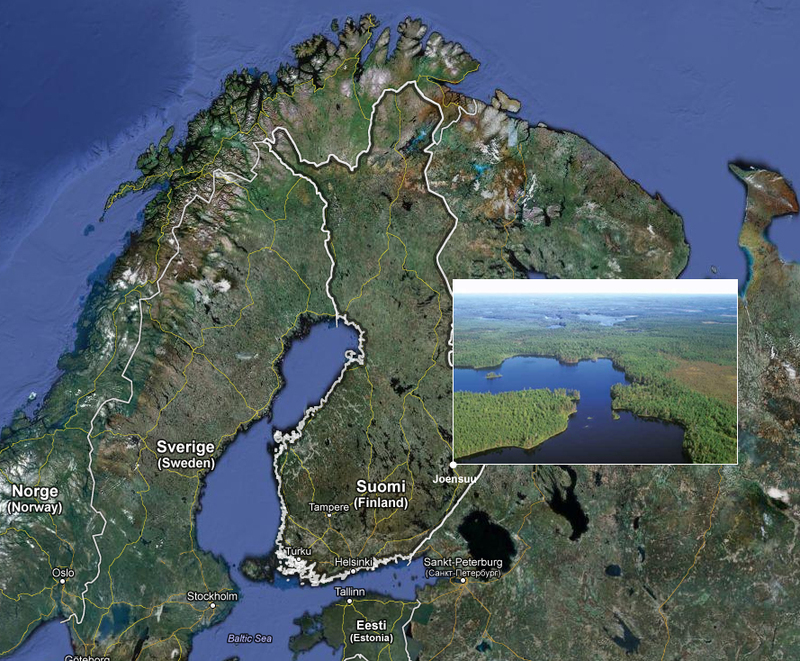 The northern boreal case study area is located in the Provence of North-Karelia at the border to Russia. The area represents the mid-boreal forest landscape in the central part of Finland (62o N) (Figure 1). The forests in the case study area are privately owned, and they are regularly managed mainly for timber production. Population density in the area is low (< 10 persons per km2). Figure 1. Location of the northern boreal case study area in the central part of Finland. The current climate (1960 -2000) used in the study was that for the Joensuu airport (N 62o 40’, E 29o 38’, asl 94 m) close to the study area. Under changing climate, CO2 is expected to increase from 363 ppm to 635 ppm until 2100. Corresponding increase in annual mean temperature will be from 2 to 6 oC; in summer temperature (June, July, August) from 14 to 17 oC. At the same time, the annual precipitation is expected to increase from 500 mm to 550 mm, the main increase occurring outside the growing season (June, July, August) (Figure 2). Figure 2. 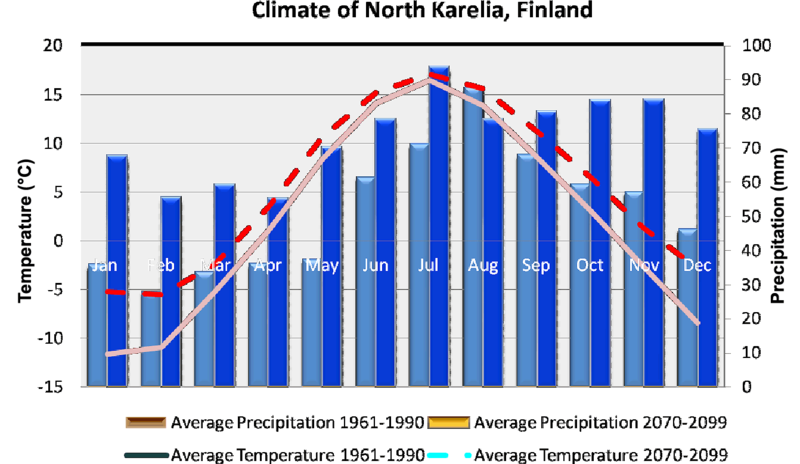 Monthly distribution of temperature and precipitation currently (1961 – 1990, CUR) and under the changing climate (CC, 2070 – 2099 Motive A1B scenario) in the northern boreal case study area. The total land area in the case study is 1520 ha, of which 950 ha is forested. The rest are small fields, lakes and roads etc. Forest land is dominated by even-aged stands of Scots pine (Pinus sylvestris), Norway spruce (Picea abies) and birch (B. pendula and B. pubescens). A part of the forest land (44%) is of low fertility (Calluna (CT) and Vaccinium (VT)) occupied by Scots pine, whereas 32% of land is of medium fertility (Myrtillus type, MT) occupied by mono-species stands or in mixtures. The rest (24%) of the land is of high fertility (Oxalis–Myrtillus type, OMT) occupied mainly by Norway spruce and birch pure or in mixtures. The productive forest land (the annual mean growth potential ≥ 1 m3 ha-1 yr-1) is distributed in 650 separate stands (Figure 3 and 4). The age class distribution is fairly even across the whole area, representing 25% in the age class 1-19 yr, 39.4% in the class 20-59, 19.5% in the class 60–99 and 16.1% in the class with the age > 100 yr. The total stocking of stem wood over the whole area is 233 500 m3, representing mainly Scots pine (53%) and Norway spruce (31%). The share of birch is 16%. Figure 3. 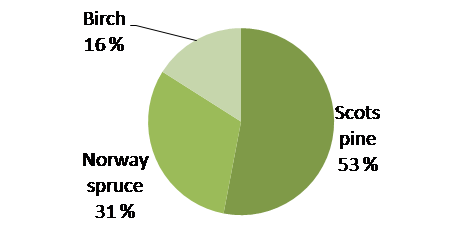 Share of different tree species from the total stem wood stocking in the case study area. Figure 4. Map of forests in the case study area showing the separate stands with the stocking of stem wood. The forests in the case study area are traditionally used for timber production. This is still the main use, but the production of energy biomass is increasing in the form of harvesting logging residues, including stumps. This is why the forest owners are the main stakeholders in the area. Each forest owner is a self-governing decision-maker, who controls the management in the area owned by her/him. In this regard, they have support from the Finnish Forest Centre (North Karelia regional unit), which is an advisory and regulatory body regarding the forestry and management of forest environment. Further support is given by the forestry experts of the Regional Forest Management Association of Pohjois-Karjala, which has a major role in providing support and guidelines for forest owners in regard to management, timber trade, forest planning and implementation of practical forest management. Nature Conservation Association and Hunting Association are also interested in the management and use of forests in the case study area, but they have no legal right to control the management in the area. However, they may lobby how forests should be management. In this regard, the landscape amenity, recreation, including collecting mushrooms and berries, and hunting are important issues. The access in the area is free for public, but the hunting rights belong only to forest owners. Are tree species in forest sensitive to climate change? Which adaptive measures appear as suitable response to the changing climate in order to sustain the provision of demanded ecosystem services? What is the recommendation to the forest management? How did you make your conclusion(s)? Which tools and methods did you employ? How do you incorporate uncertainties in your recommendation?